Project management is not something everyone can master overnight. There are many project managers and business professionals that make handling multiple projects look easy. You are always going to have an easier time managing your tasks using the right tools. 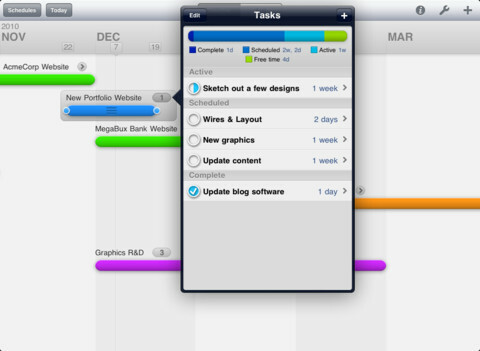 Timeli for iPad is a handy tool for keeping up with project schedules and tasks on the go. Timeli is quite useful for project planning. You can track multiple projects with this at once. You can interact with the app easily. Just pinch-to-zoom to see more details for each day. Making changes to your project is easy. 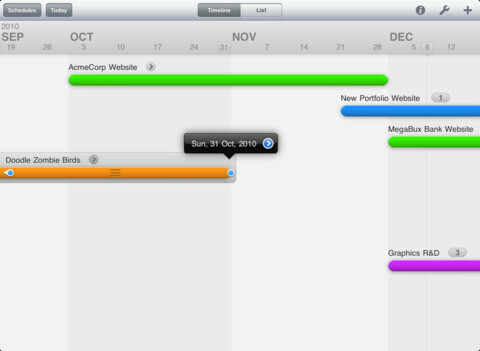 Timeli also lets you keep track of the time you have scheduled for tasks and projects. You could always print your schedule using AirPrint or send it to others over e-mail. Overall, Timeli is a pretty decent tool to use to manage your tasks and schedules. It is not the best project management app we have tested but the app has potential.